Complete mobile auto detailing using "Eco-Friendly" technology, we clean and detail individual and fleet-owned vehicles, including cars, SUVs, pickup trucks, boats, and RVs at your home or office within 25 miles of the Yukon, OK area...this includes Oklahoma City. 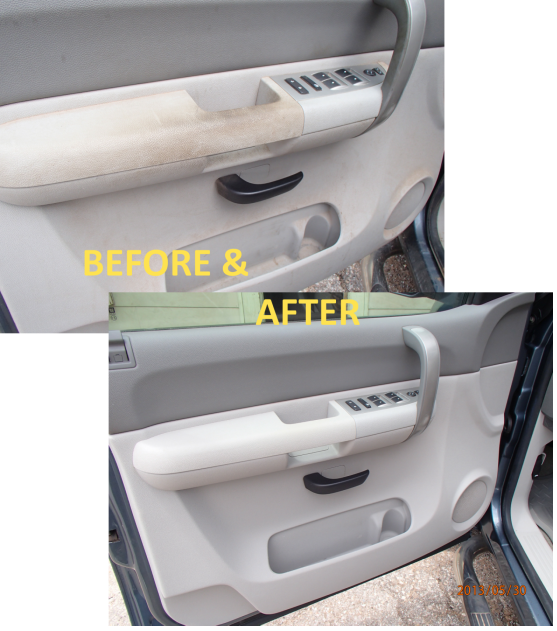 No need to waste your time just because your vehicle needs to be cleaned. The following flat-rate price schedule is for individual vehicles showing normal "wear and tear" and soil1. For pricing puposes, the following criteria are used. To BUY ONLINE see below. 1 Vehicles with excessive "wear and tear" and/or excessive soil are subject to additional charges. If at the time of pre-cleaning inspection , hard set stains are found, you will be quoted a special price for removing the stains. 2 If at the time of pre-cleaning inspection, your vehicle requires heavy odor removal, you will be quoted a special price to perform this service, prior to placing your order. Our equipment targets smoke residues, bacteria, viruses, mold, mildew, fungus and VOC’s*. Harmful remnants from saliva, urine, vomit, feces and blood are also destroyed. Our special DynaBreeze ionization equipment refreshes the entire interior area leaving a touchable, breathable environment for our customers.